Adjustment to a new family means more than enough stress to the puppies, let's not burden them even more by changing the feed they are used to. I say, this should be avoided at all cost! The diet the breeder created should be continued for at least 4 days. The new feed should be introduced gradually strictly by mixing it into the one supplied by the breeder in larger and larger quantites. Say, Day 5 should see 30%, Day 6 50%, Day 7 75% and Day 8 100% of the new pet food. Buy a puppy from me and I'll make sure you'll receive enough of the old feed to see the program through. Ignore this and you'll have diarrhea to battle with. Puppies need the best possible diet whilst they are growing up. Puppies grow 20 times faster than adult dogs and so require a special diet to aid their physical development. A specially formulated growth food is recommended which needs to be fed at evenly spaced intervals to avoid over stretching their small stomachs. 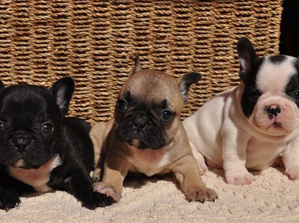 A responsible breeder will have given you advice about your puppy’s diet. Feed your puppy four meals a day up until the age of four months, and then reduce its feed to three meals a day until it is six months old, when you can change to two meals a day, and keep it on this regime for the rest of its life. It is better not to leave food down (so throw away any uneaten food after 20 minutes) and not to give your puppy any variety, which could cause havoc with its digestion and toilet training regime. However, make sure that water is always available to your puppy, so never take its water bowl away. There are many different feeding regimes to choose from: dry complete diets, semi-moist or tinned food with or without biscuit mixer, and home-made food. Within this, there are many different qualities. The most suitable diet should be easily digested and produce dark brown, firm, formed stools. If your puppy produces soft or light stools or has wind or diarrhoea, then the diet may not suit your puppy or it might have some kind of digestive problem, so consult your vet for advice. Please remember that stability in the diet will help maintain good digestion. Any change in diet should be made very gradually over at least a week to avoid upset and you should try a new diet for at least 10 days before making any further changes. There is a wide range of dry complete foods on the market and the quality varies widely. To get the best out of your puppy’s development choose a food specially designed for puppies and buy the best you can afford. The ‘premium’ dry puppy foods tend to have the best quality ingredients. Many are based on chicken and rice or corn, and suit most puppies really well. Although these foods may appear more expensive to buy, you do not need to feed the large amounts you would with a lower grade food, so many of them actually work out to cost the same, if not less! Some puppies are not accustomed to complete dry foods immediately after weaning but will normally grow to like them with time. If your puppy does not seem to like eating dry complete and this is what you wish to feed you can try soaking the food in a little warm water to soften or mix in a little tinned puppy food, gradually reducing the quantity until he is fully weaned and accepts dry complete. As with complete dry foods, tinned foods and semi-moist foods can vary in quality. Again choose a good quality food with an easily digestible recipe i.e. chicken and rice and choose a specialist puppy food which is nutritionally complete (i.e. does not require additional foods to be added to it). As before it is best to avoid changes in your puppy's diet so if you find a product that works for your puppy, stick to it. Puppies need the best possible diet whilst they are growing up, as even a slight imbalance may harm their development and growth. As it is very difficult to get this balance right, you are probably better off choosing from one of the tried and tested commercial diets. Any change in diet should be made very gradually over about a week to avoid upset and you should try a new diet for at least 10 days before making any further changes. Some dogs appear to be sensitive or intolerant to certain ingredients and additives and this can cause a variety of problems. In extreme cases they can get colitis (slime and blood in their stools) so consult your vet if this happens. As with children, the most common food intolerances appear to be colourings, sugars, wheat, milk and soya. Obviously not all puppies are sensitive to these things, but if the symptoms keep re-occurring, you might do well to check this out and ask your vet for advice. 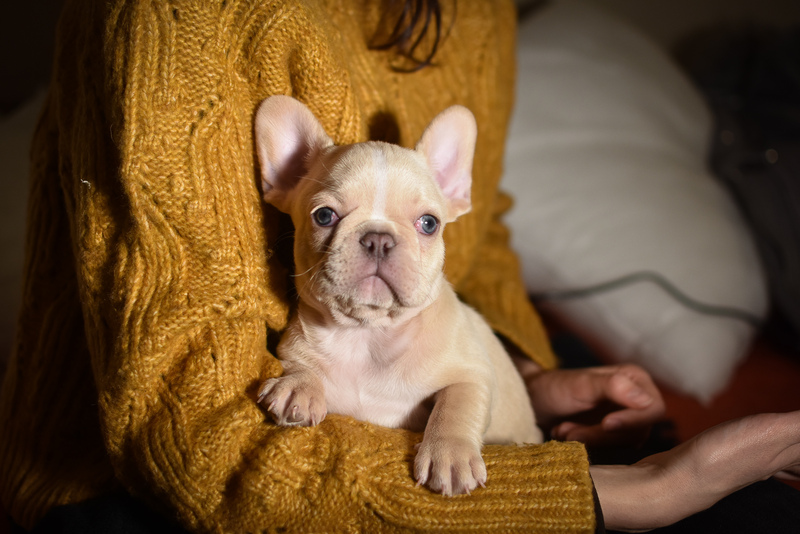 If you suspect a food intolerance you should avoid giving your puppy any foods or treats containing any suspect ingredients for a month or two, and then reintroduce each ingredient, one at a time, and watch for the return of any physical or behavioural changes. You can use some of its food (from its daily allowance) as rewards. Treating is a good way to reward your dog during training and encourage the behaviour you want. There are a wide variety of prepared and natural treats on the market which vary hugely in quality. Some commercial treats have lots of sugar, colourings, milk products and fat in them. Even ‘doggy chocs’ or ‘low fat yoghurt drops’ can contain sugars or lactose (milk sugar) so always check the ingredients label. Good quality prepared treats have been developed with dogs dietary needs in mind. However, all treats should be given sparingly, never more than 15% of the total calorie intake. If used regularly reduce the amount of main meal food your dog is receiving in order to avoid obesity. Some chew treats have proven ability to help prevent dental diseases, but again check the label to ensure you are getting a genuine product. Real chocolate is poisonous to dogs and can cause liver damage and even be fatal, so never give your dog any chocolate, or leave any lying around for it to find and eat, especially at Christmas time. Avoid giving your puppy any sweet biscuits or sugary treats which are bad for its teeth as well as its waistline, and can cause sugar ‘highs’ and ‘lows’. Stick to prepared treats and desiccated liver tablets which tend to be much more popular than boring bits of doggie biscuit. Clean fresh water should always be available. Dogs eating wet food (ie: canned) will receive moisture through their food and therefore require less water than dogs eating dry food. However, extra water should always be made available. Owners should not refill half empty bowls, but ensure that fresh food is always provided at each meal time. This is particularly true in the hot weather when food left in bowls can attract flies and other insects. Half full cans of dog food should be kept covered in the fridge, but allowed to stand until the food is up to room temperature before feeding. There are two different types of dog food manufactured,"complete" and "complementary", clearly marked on the label. A complete food can be fed as a sole source of nutrition and is available as both canned and dry food. A complementary food is designed to accompany the complete food and should not be used as the only source of daily nutrition. Avoid feeding table scraps, these can upset the balance of nutrients provided by commercial prepared dog food. Treats are a great way of bonding with your dog, but ensure that they are specially manufactured for dogs. Treats will contribute to the dogs daily dietary intake and owners should take them into account and remember to adjust feeding at meal times accordingly. Puppies have high energy requirements, but small stomachs - therefore owners should feed small meals frequently throughout the day. Follow the feeding instructions on the packaging. A healthy, fit dog is a happy dog! Owners should be able to feel their dogs ribs, but not see them. Always try to feed to maintain this condition. Owners should avoid any sudden change of their dogs diet. A change from one food to another should be done gradually with the new food increased over a number of days until that is the only food fed.